If we consider and ask ourselves what sort of music we should wish to hear on entering a church, we should surely, in describing our ideal, say, first of all that it must be something different from what is heard elsewhere; that it should be a sacred music, devoted to its purpose; a music whose peace should still passion, whose dignity should strengthen our faith, whose beauty should find a home in our hearts to cheer us in life and death; a music worthy of the fair temples in which we meet, and of the holy words of our Liturgy; a music whose expression of the mystery of things unseen never allowed any trifling motive to ruffle the sanctity of its reserve. Hallelujah from the heart of God, and from the hand of the artist inimitable, and from the echo of the heavenly harp in sweetness magnifical and mighty. M USIC, LITURGY, AND SPIRITUAL LIFE at the Church of the Ascension and Saint Agnes have traditionally been known for their positive affirmation and proclamation of the Catholic faith in forms that respect the maturity, intelligence, refinement, and emotional richness of human beings. Music is integral to the parish's worship because music aspires to express what is otherwise inexpressible. At high Mass each Sunday morning at 10:00, and in special events over the course of the year, we offer to God the best we can. Music at Ascension and Saint Agnes is also part of our outreach to the Washington area community and is a vehicle for carrying the Gospel into human hearts. THE CHOIR sings the Mass ordinary and anthems at the Offertory and Communion. Propers are chanted in Gregorian settings. 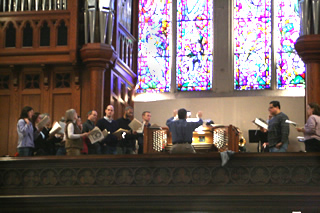 The congregation and choir sing hymns from the Hymnal 1940, Hymnal 1982, the New English Hymnal, and other appropriate sources. 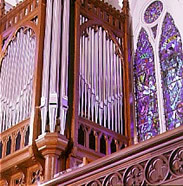 HYMNS AND ORGAN LITERATURE reflect high standards of liturgical art. A sizable scriptorium of published and manuscript religious music supports the efforts of the parish musicians, the quality of whose offerings is known and highly regarded throughout the Washington metropolitan area. The choir's repertory includes plainchant as well as the works of composers from all parts and ages of the Western Church: Lassus, Palestrina, Josquin, Tallis, Byrd, Victoria, Cardoso, Stanford, Poulenc, Kodaly, Walton, Mardirosian, Steel, Pärt, and Stravinski. The Church of the Ascension and Saint Agnes is one of the few places in the Washington Metropolitan Area where this music can regularly be heard as an integral part of the traditional western liturgy for which it was composed. Membership in the Choir of the Church of the Ascension and St. Agnes is open to all qualified singers by audition. Interested prospective singers are invited to contact the parish office at ( 202) 347-8161.